A comfortable ‘front pack’ for this shih-tzu as her owner walks around Ventimiglia market in Italy. It is finally April, and I don’t think I’ve ever looked more forward to transitioning to warmer weather clothing. The styles you see above are a few that have especially caught my eye over the past couple of weeks. I’m planning to purchase one of two of them to add to my spring/summer wardrobe. I think the High Road Jumpsuit (#1) is my favorite. I just love a good jumpsuit and the off the shoulder style and embroidered details are perfection. I’m also a huge fan of the Striped Retreat Dress (#8) which is so simple and would be such a great practical-yet-super-cute everyday piece for the spring and summer. Click on links above to see where to find each of them if you’re a fan as well! (Yes. That’s a black-backed jackal on the Youtube featured image. It is not in this video). It’s vacation day! We’re Arizona bound, and boy am I ready for a holiday. While I admittedly miss those pre-kid days of nonstop travel and regular opportunities to explore the world, I can honestly say that I appreciate the handful of smaller trips we now get to take each year more than those constant trips of years past, simply because they are so much fewer and, therefore, feel more precious. 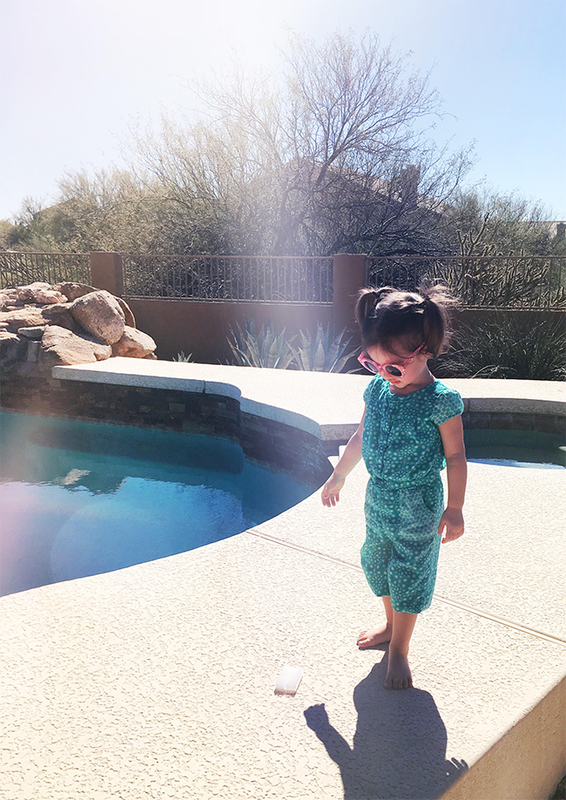 We usually keep the blog active when we travel with prescheduled and/or contributor posts, but I’ve made the decision to take a break for the remainder of this week and just focus on hanging out in the much needed sunshine with my family (check out Essley chilling poolside on last year’s Arizona trip; I call it her ‘album cover’ shot). You can still follow along with our adventures on Instagram, both in our photos and on our IG stories, and we’ll be back next Monday with a seriously excellent giveaway. In the meantime, enjoy your week! And try to take a break for yourself too, okay? Sinead Ellis is 25 years old and lives with Parkes Weber Syndrome (PWS), a rare congenital condition. There is currently no cure for PWS. The U.S. National Library of Medicine notes that PWS causes arteries and veins to form abnormally, often causing excruciating pain and sometimes even heart failure. In addition, PWS often causes one limb to grow abnormally large compared to its match. In Sinead’s case, her right leg is almost two times larger than her left leg. 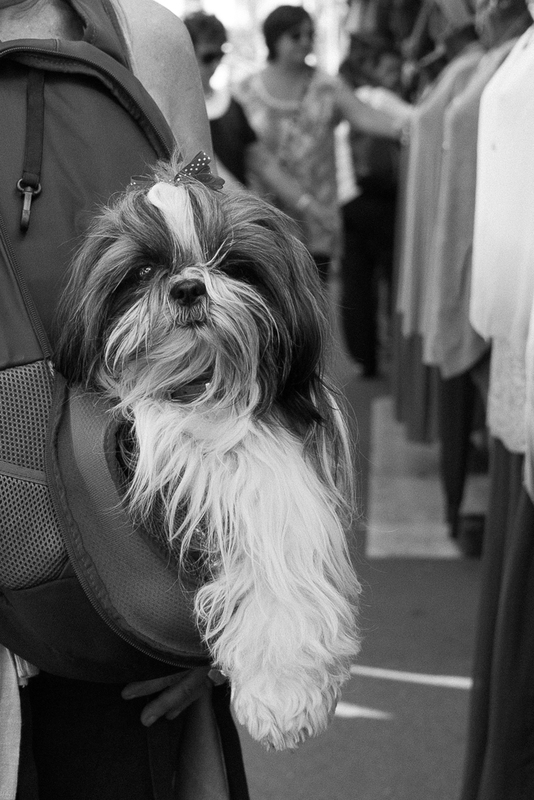 Sinead deals with her condition with grace and good humor, but perhaps most life-saving has been her dog, Paddington. According to The Dodo, this sweet poodle is in training to become a certified service dog, but he’s already changed Sinead’s life. Paddington has already not only healed a literal hole in Sinead’s right foot, but he has helped with her anxiety, balanced Sinead on walks despite her legs being different sizes, and even learned to monitor Sinead for signs of internal bleeding. Read more about Sinead and Paddington. Vegan dishes can be just as varied and exciting as a regular omnivore diet. The key is to try new things and be open to new flavors. Spring is the perfect time to change up your recipe book because fun, fresh produce will start pouring into the farmer’s markets and stores. Tender, delicate spring fruits and vegetables like lettuces, strawberries, leeks, and ramps are all excellent additions to vegan cooking. These delicate spring flavors won’t be overpowered by meat, and when you use a vegan recipe, these ingredients will shine. 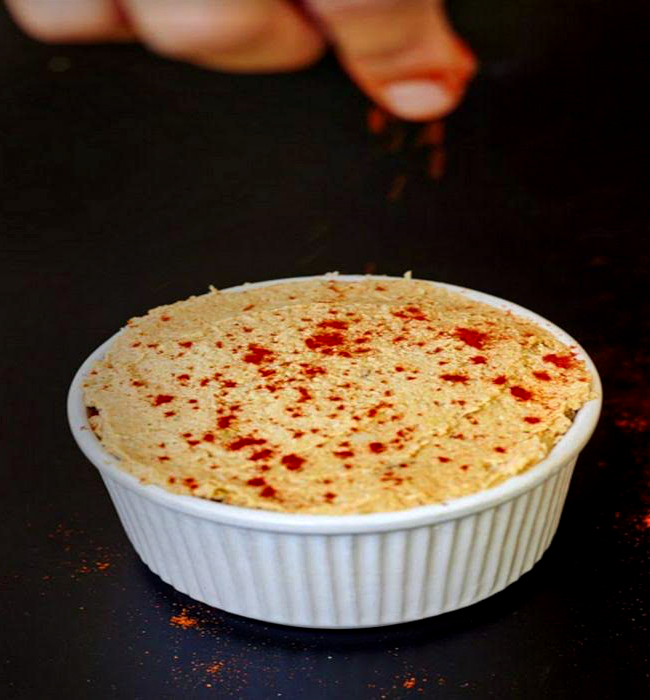 Here are seven great vegan recipes to try this spring. This colorful Spring Carrot, Radish, and Quinoa Salad with Herbed Avocado by Cookie and Kate is a lovely vehicle for spring radishes. The peppery bite of the radish blends perfectly with the sweet carrot and buttery avocado in the salad. 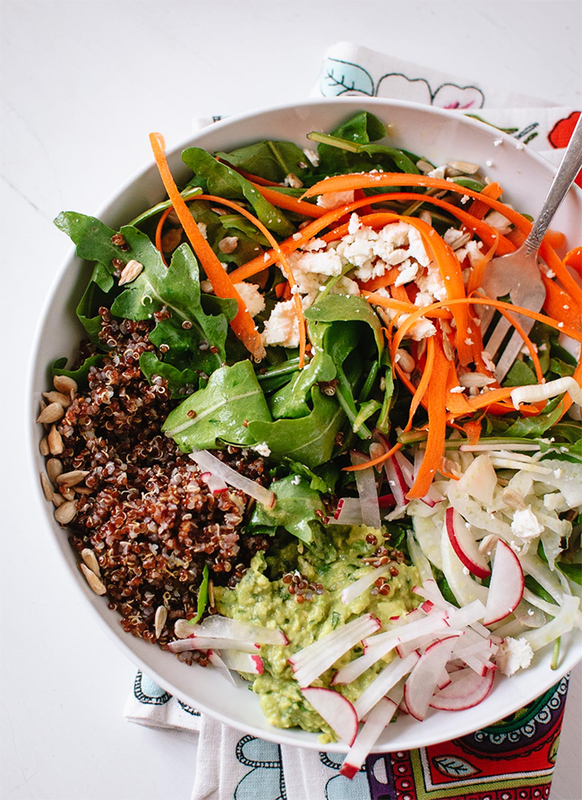 Combining these delicate raw vegetables with cooked quinoa produces a more filling salad, and combining the grains with the vegetables and greens creates the perfect meal for a cool spring day. The grains are a hearty hold over from winter, while the greens and radishes highlight spring’s coming goodies. 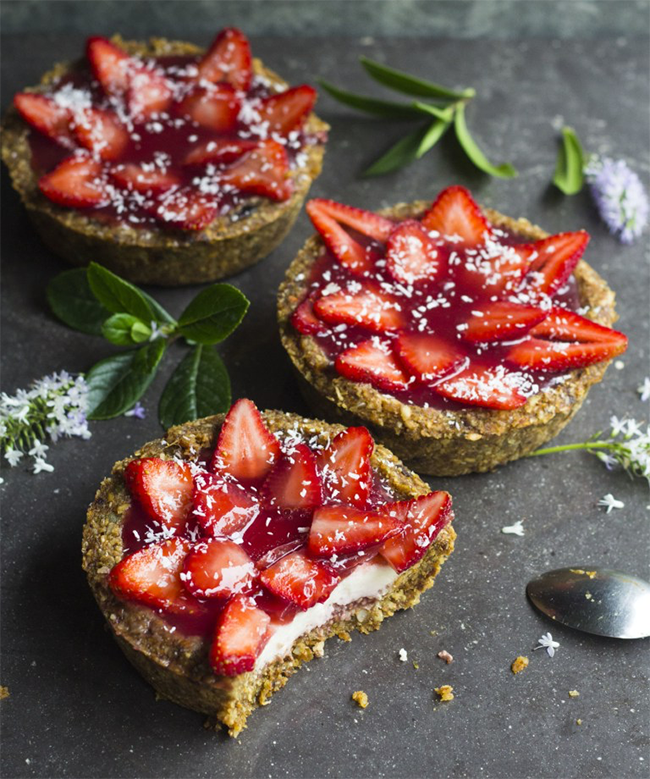 These Strawberry and Lemon Tarts by Rainbow Nourishments use seeds instead of nuts or traditional flour for the tart crust. This technique gives the crust a great bite, and it’s always nice to have a few nut-free and vegan recipes in your pocket. The tarts feature beautiful strawberries on top, and this recipe would make a wonderful addition to a spring party like a baby shower, a graduation party, or a wedding shower. 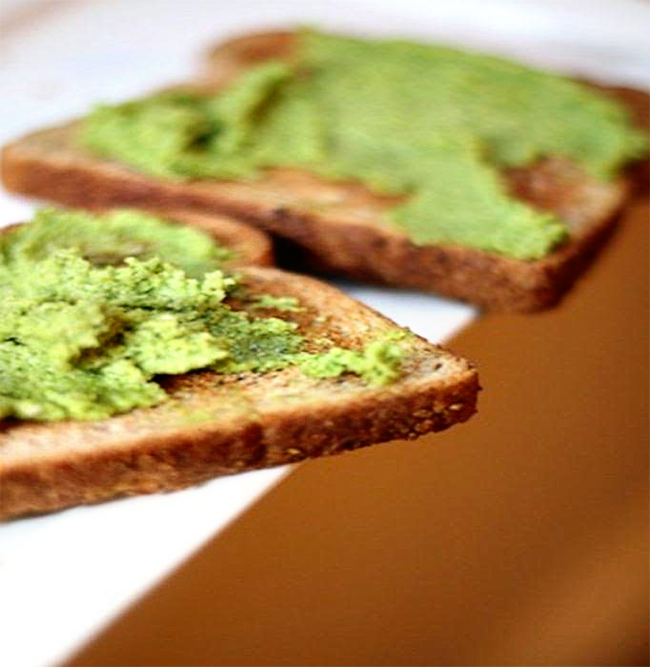 This Vegan Garlic Scape Pesto by Oh She Glows is the perfect spring condiment for pasta, sandwiches or cold salads. Garlic scapes are the top part of the garlic plant, much like the top shoot of a young onion. Like green onions, garlic scapes have a more mild flavor than the garlic bulb itself. This recipe combines a vegan parmesan “cheese” along with olive oil and traditional pesto ingredients to create a mild, nutty pesto that is perfect for showcasing the garlic scapes. Scapes aren’t in season very long, so make sure you whip this up while you can! What could be more seasonally appropriate than these tasty Vietnamese Spring Rolls? These rolls (by Simple Vegan Blog) are a great appetizer, and they showcase several lovely spring vegetables like carrots, cabbage, and greens nicely. They are also very easy to make, and they also travel well. 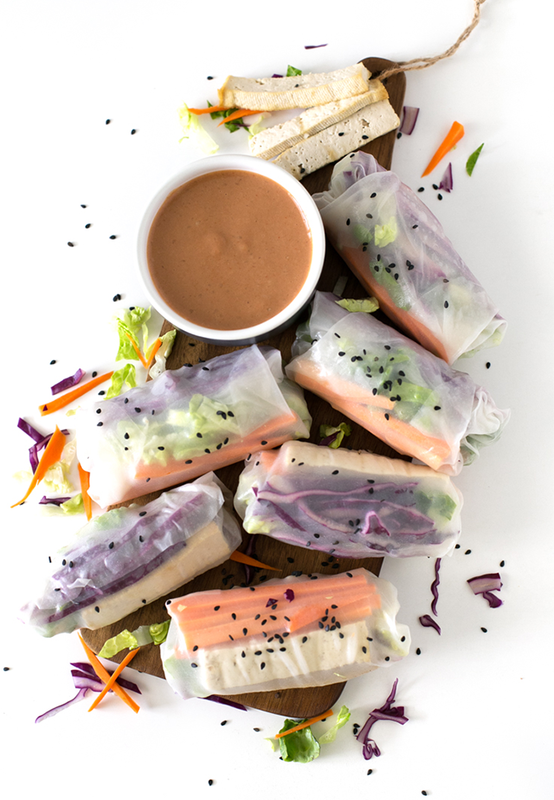 Try packing a picnic lunch with these spring rolls and some sauces to make a fun spring outing. Peanut sauce, plain soy sauce or tamarind sauce all pair well with these tasty and simple Vietnamese spring rolls. 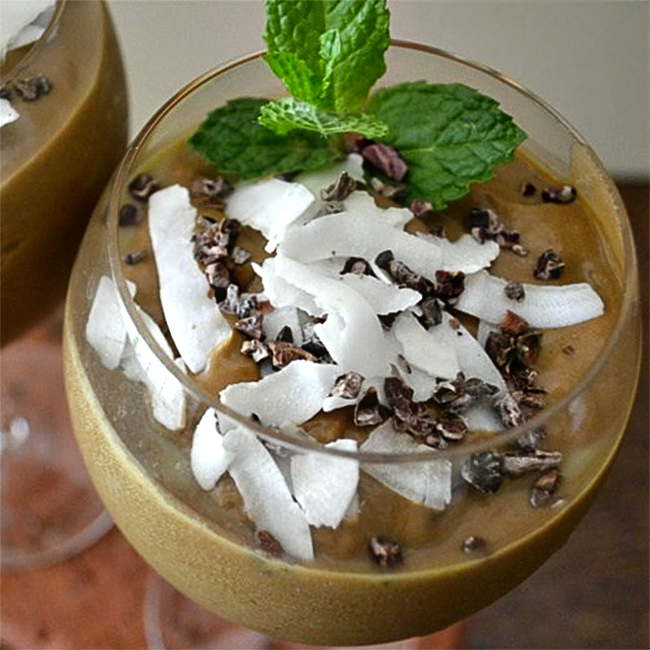 Sometimes being vegan means missing out on certain tastes from your childhood but not with this Cocoa Coconut Mint Smoothie from An Unrefined Vegan. If you’ve ever drooled over the memory of that neon green Shamrock Shake a certain clown panders, then this is the St. Patrick’s Day treat for you. It doesn’t have that green glow, but it has a terrific minty flavor that won’t make you regret going vegan for one second. This smoothie is packed with vitamins and healthy fats from the coconut. It’s a great treat to prepare in big batches. Try it frozen! This fresh and easy 5 Ingredient Warm Artichoke Dip from Delightful Vegans really highlights fresh, spring artichokes. This vegan version won’t weigh you down with heavy cream and cheeses like a non-vegan artichoke dip. Instead, the artichokes are blended with cashews and a little bit of nutritional yeast to give it a cheesy flavor. This dip is a great dinner party starter. It’s also much easier to serve to a crowd than individually roasted artichokes, which can be cumbersome to prepare in large quantities. We bet that most guests won’t even realize it’s vegan. The Tomato Tart’s Orange Roasted Asparagus is the perfect recipe to emphasize the tender stalks of spring asparagus. 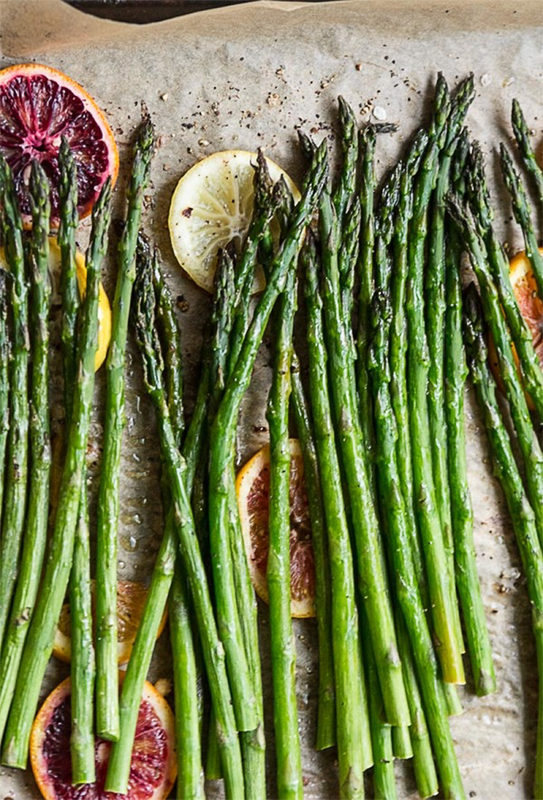 The orange flavor is a delicate compliment to the crisp asparagus. This recipe is simple and an easy side dish to compliment any meal. While asparagus is available year-round, fresh spring asparagus is a real treat to the taste buds. If you’ve never had very fresh asparagus, then run out to your local farmers’ market and get some this spring. We hope these seven vegan recipes have inspired you to try all that spring has to offer. Fresh spring produce is a delicious addition to any diet. However, once you go vegan, these items take on a new zest and depth of flavor. Don’t be afraid to try new produce when you see it in season because that is the best way to experience the real flavor of the food! A longtime vegan and advocate for veganism, Hamish regularly shares his favorite recipes on his website, Hamish McLaren’s Vegan Recipes. Links I Love posts usually only happen once a month, if that, around here, and always on Fridays. And here we are on Thursday, and it’s the second LIL this month. I feel so rebellious. The reason for posting again this month is simply that I’ve come across a lot of great links this week (and it would be totally rude to keep them to myself, right?). And I’m posting this today rather than tomorrow because the kids and I are heading up to Milwaukee in a couple of hours to meet my husband at work. The band is playing three shows up there starting tonight, and since it’s less than a couple of hours away, we thought it would be fun to bring the kids tonight so they can dance at soundcheck, eat dinner with daddy, catch a couple songs of the show, then spend a night away in a fancy hotel and have breakfast and lunch together before heading home tomorrow. And then tomorrow evening begins my stepmom’s huge birthday party weekend extravaganza, and we’re excited. There are literally dozens of people flying in from all over the country for it, and all sorts of activities planned. She is Swedish so the whole thing is Swedish themed. So fun. I’m sure I’ll be sharing lots of live moments over in my Instagram stories, both of the kids’ hang-with-daddy-at-work band adventures and the super huge special Swedish birthday celebrations. Because I’m a sharer, and stuff. 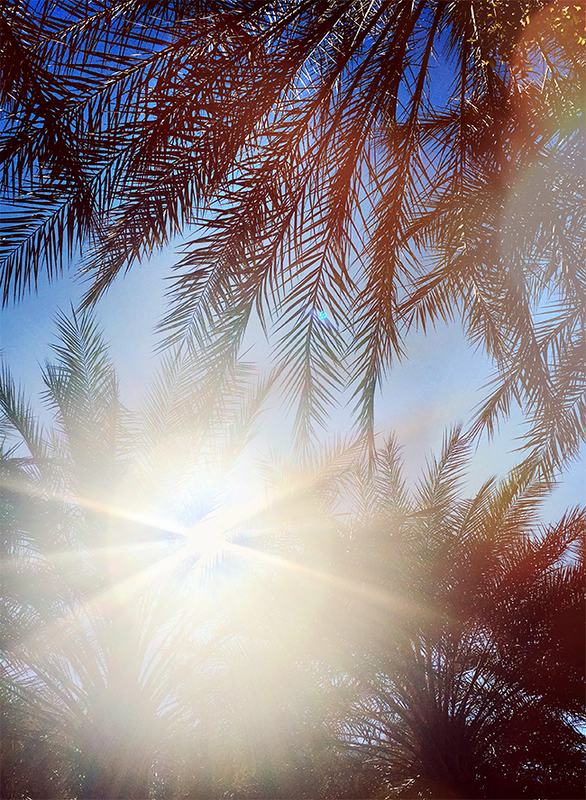 These desert inspired desktop wallpapers are getting me so excited for our Arizona trip. Just a few more days, guys. I really love this piece on the 5 principles of the slow design movement. The idea of letting your home grow with you especially resonates with me. We’re going to have a decorating budget pretty freaking close to zero once we finally move (yes, we’re still looking, but it is happening, and very soon), so our design process will be very slow and deliberate – and I’m glad. Yay! The Fearless Girl statue is sticking around for longer than planned. She’ll stay face to face with Wall Street’s charging bull through February 2018. You hear about postpartum depression all the time, but what about prenatal depression? With both of my pregnancies, but especially my first (Essley), I had frequent panic attacks in the second and third trimesters (out of nowhere, for no reason) and some short bouts of depression as well. And I felt completely fine after giving birth, and (thank goodness) never had any issues at all with PPD. I love this piece that talks about one woman’s experience with it. I could relate on many levels. These beet dyed deviled eggs are so pretty, and perfect for Easter. Can you correctly spell these spelling bee words? While I never turn down a good piece of cake, these blooming flower cakes, created to celebrate the arrival of spring, are too gorgeous to eat. They just are incredible. What are you up to this weekend? I’ll see you back here on Monday!